Love your recipe for an amazing vignette. Love all the elements and textures. TU! The shattered glass is an amazing touch - such a brilliantly aged shadow box full of treats. You need to have an eye test lol! I can't believe I failed to see you...I'm sure we must have passed somewhere. So sorry. All your projects just stood out, and aside from the bee, this one was magical with that mica...a real WOW for me! Oh, Vicki, the project is so perfect... I love the way your blog is constructed, too. 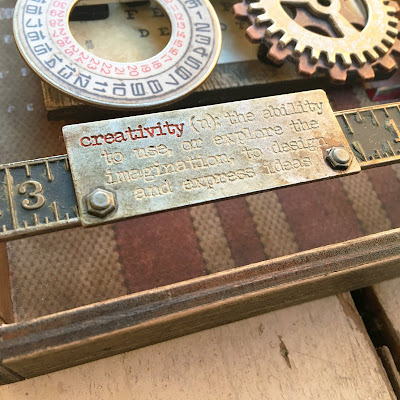 I follow you blog for all the creative ideas; I can ALWAYS count on you to use the products in a new way or show a wonderful technique! All of your projects at Creativation were magnificent, thank you! Terrific, interesting and so unique, I was happy to see mica being used, I think it adds a wonderful element to the overall vintage feel. Absolutely gorgeous, and the sheet of mica is genius! 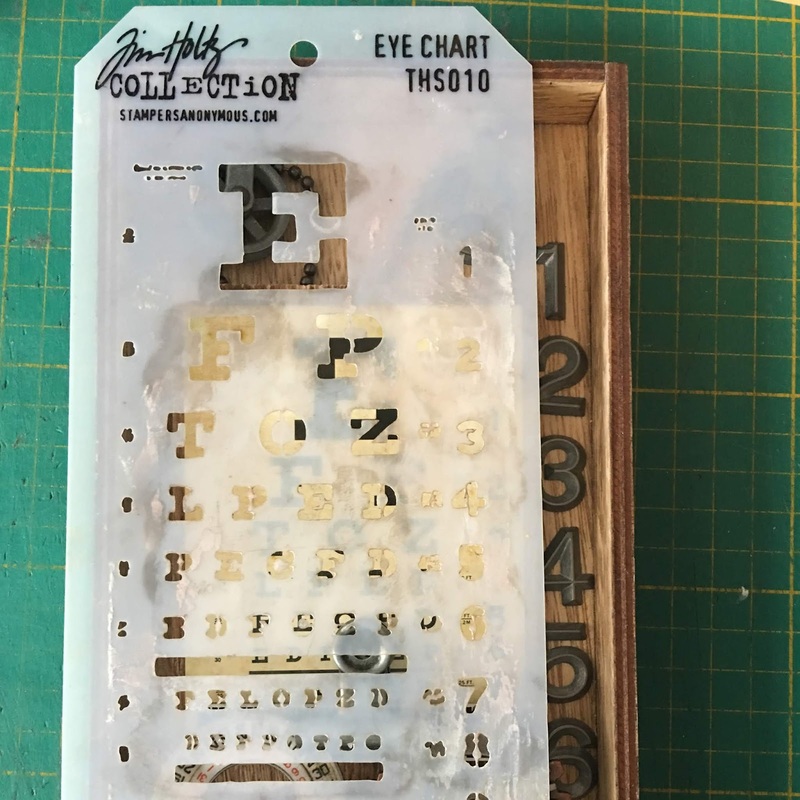 Your use of the eye chart stencil is perfect. Every layer adds to the story from the background to the mica. love it. Thank you so much Vicki! Love your vignette tray and the mica is perfection! Your work is so inspiring. Love this! This is absolutely brilliant! So inspiring and captivating! Just makes you want to keep looking at it! Oh my! This is such an industrial piece, I love the roughness of the details and I just LOVE the piece of broken "glass" - this was the most brillant idea ever! I can’t even handle that eye chart stencil. I need to get one now! I have those rulers too but I like them too much to use them. Oh my, soooo awesome!! Love the masculine feel and love the mica!! Thank you!! Wheels as pullys is brilliant, and I love bringing mica back to the forefront. It works wonderfully with Tim stuff! So much fun! Thank you for sharing with us. Love it! 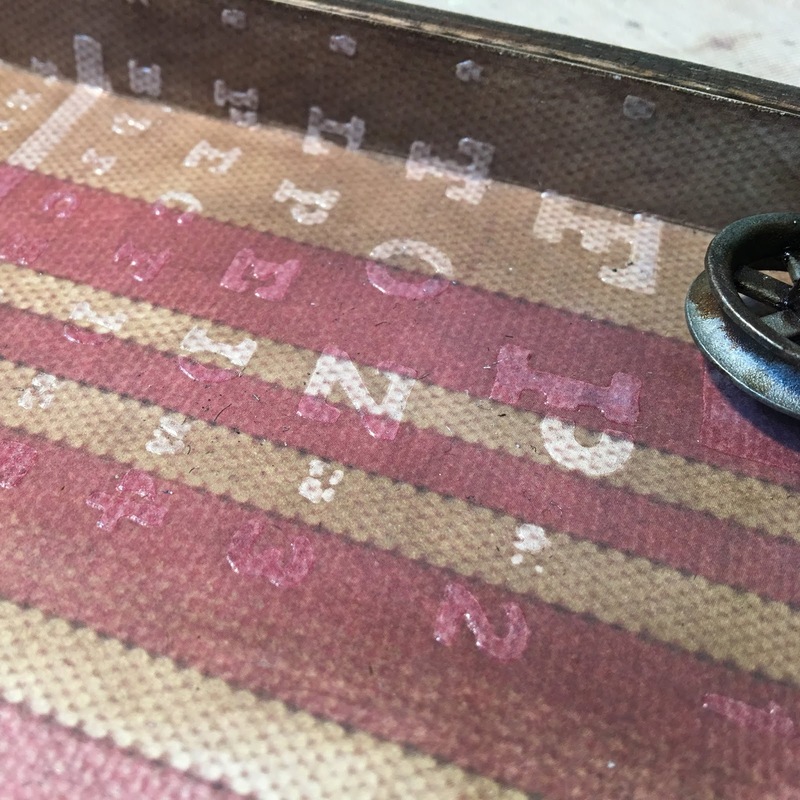 I'm really loving the mica and the eye chart stencil. Great job! TFS! WOW such wonderful use of some great products. Love this as a piece of grungy art. Thanks for the inspiration. I love the eye chart!! Great vignette!! Have always had an affinity for eye charts - love this! Also, had a little chuckle over your "wet ingredients" and "dry ingredients". I love the mica too. The whole project is amazing. So inspiring! Love the mica and also the use of ball chain. Simply fabulous. Love all the ephemera and doo dads you incorporated in this! Toooo cool! Grungy perfection! Thanks so much. Oh my gosh, this is one recipe for a vignette that I would love to make. Great job, love the broken glass too. Thank you for sharing and inspiring! Love your imagination and recipe for inspiration! Love your piece and thank you for sharing. The vintage look of this is perfect. love the gears with chain. Very creative. What a fun and creative project! I loved seeing everyone's ideas that Tim shared on his video post. Nice! So what is this mica and where do you get it? where am I going to have all the room I need to display projects made from all your wonderful samples? thanks as always for sharing. I love all the embellishments you used, Vicki, along with that wonderful piece of mica! Oh my how cool is this; the details are so fun! Just blown away by all the creativity! Hmmm what's my favorite part??? Well lets start with the awesome piece of mica... But the idea-ology - how you used the wheels to hold up the eye chart, or how the gears and new piece (don't know the name) actually looks like steampunk glasses or the numbers running down the right hand side in the back. This is spectacular! So much metal goodness! For some reason my previous comment posted as Unknown... not sure why. This project is absolutely brilliant! So inspiring and captivating! Just makes you want to keep looking at it! Very cool! Love all the elements, texture, and trinkets. Thanks for the inspiration! I love assemblage projects, there’s so many things that catch the eye. Great job! Your details are so amazing. So impressive!!! The mica just took this over the top. I love this. Thank you for sharing such an amazing piece! Can’t wait to get some of the new products so I can try to concoct something as cool as this. Such a novel, Unique and creative project. Such creativity... Thank you for sharing. What a great recipe for a great project. Love all the details, especially the broken mica. I love that this looks like an old display piece...perfect! I love seeing everything you create and enjoy your Instagram posts. Thanks for the inspiration and the detailed photos! I love your work Vicki! this is such a cool piece. You do amazing work! Love all the detail. You've done an amazing work on this cool piece of art! Just amazing! 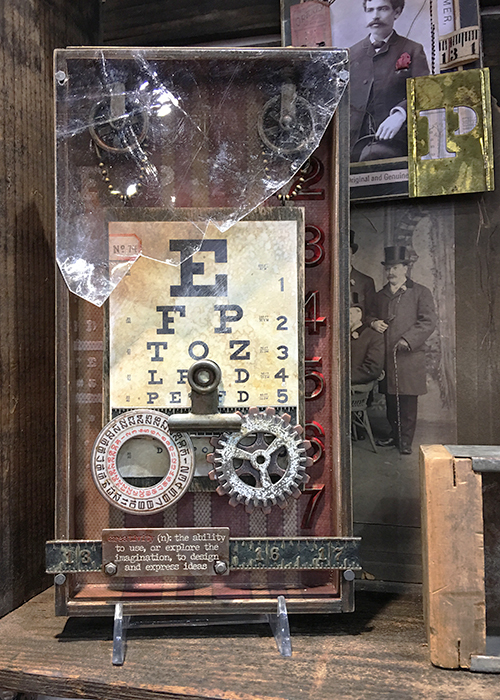 This assemblage box is so cool!!! 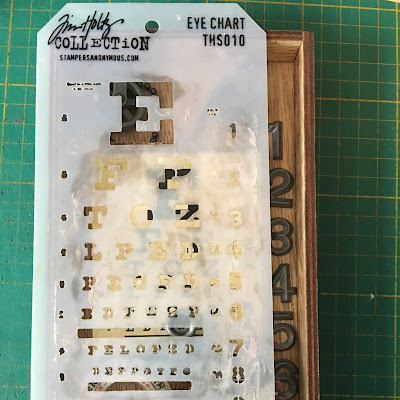 I love the eyechart and the mica sheet!!! Love the red distressed numbers! So fabulous and love the altered look of this. I think it would go great in an optometrists office too. Just love this. Thanks for sharing! 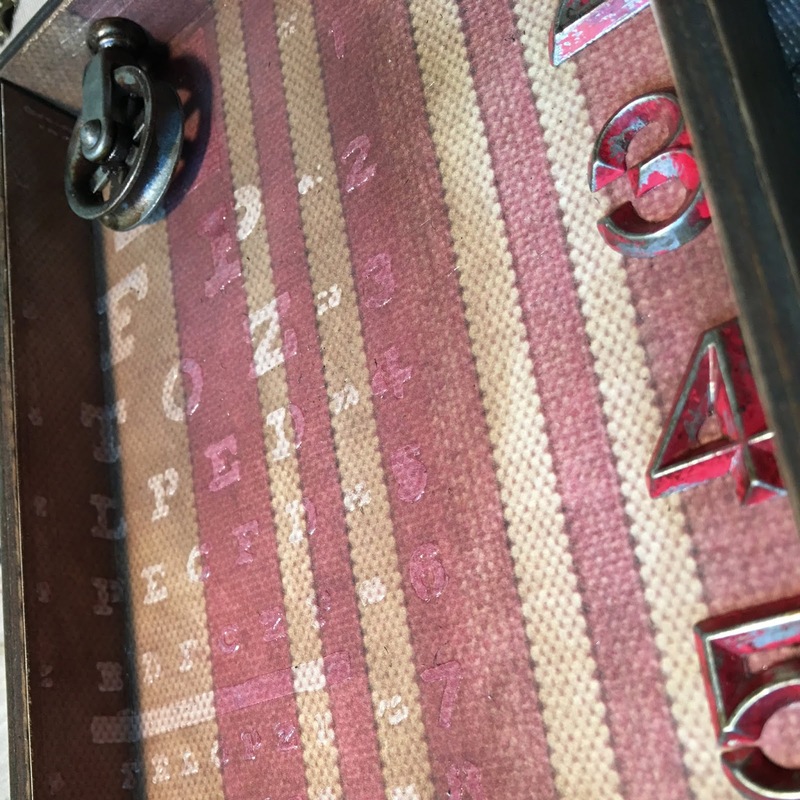 What a great piece, I love how you made the stencil image pop and the mica was such a great addition! Thank you for sharing your talent and creativity. Love the shattered glass (mica)in the top corner .. pulls it together. Another amazing project - it looks like my wish list just keeps getting bigger! Thanks for sharing. I can see why this one is your "Favorite", love every detail! Thanks for enough info that I can make it for myself if I want to... questions??? Did you use the same paper from the inside on the outside of the tray? Where does one get such large Mica pieces? Amazingly creative. That broken glass about did me in. Who thinks of stuff like that! Only creative you. It's very successful and very detailed. Bravo. Very creative art. I think I need that stencil. This is so cool! Love the broken glass. Another great idea for a gift. Beautiful vignette. Thanks for sharing. I loved this when I saw it in the Creativation videos, but my jaw is dropping over & over each time I discover the details within this project..Wow! Thanks for sharing, I look forward to seeing more of your projects! The only thing better than seeing this here would have been to see it in person at Creativation. I love how your mind works; how you get these crazy ideas and somehow make them come to fruition. No one creates like you. I love every single grungy detail, especially the glass. But it's all the parts that make the whole that keep me coming back for more. I could stare at this all day! Thank you for your inspiration! What a wonderful fantasy you have! This is really unique and special project! Brilliant idea of broken glass! What a great piece. I love the textures. Thanks for sharing. Wet and dry ingredients - cracked me up! I love all the details, especially the "pulleys" and chain. Such a great project! Thanks for sharing. What a wonderful vignette. I have worn glasses since I was a young child. This reminds me of all the times I have had my eyes tested over the years. You inspire me. Love it all!! Thanks for sharing!! An interesting and fun piece - it really appeals to me! Grunge :0) Love it. Fun project. what a wonderful project! love all the metal and the fun 'cracked glass' along the top! Great design! WHOA Vicki! I am loving this piece. 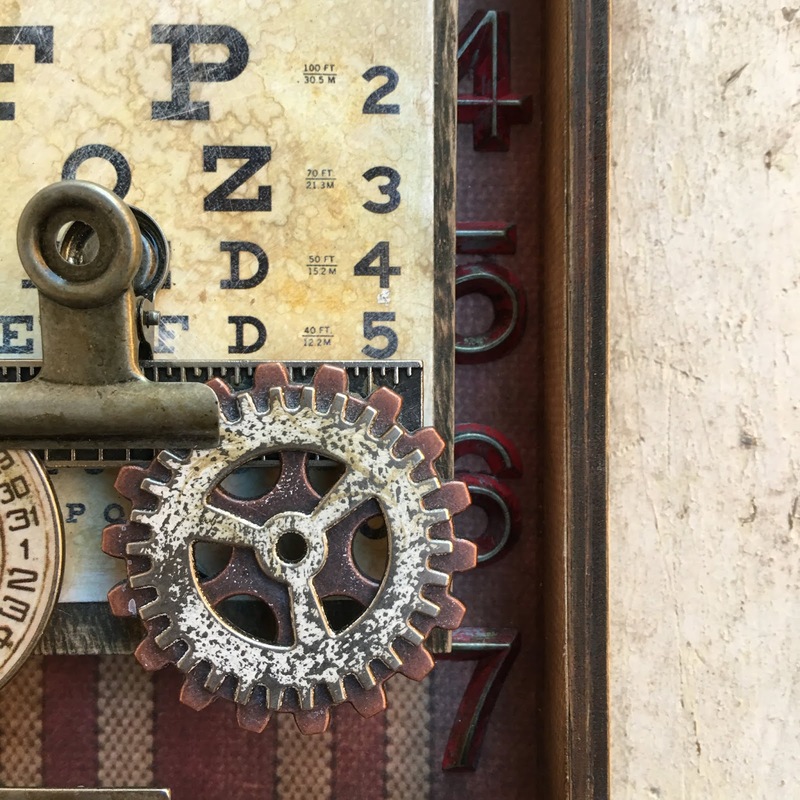 The chunk of mica makes this piece actually look older and I love the way you used the date dial and gears with the clip to look like a real piece of optometry tool...so clever. I think this is among my top favorites and I really dislike picking favorites since everyone's work is amazing. What a treat for the eyes! Love all the elements you've played with. Wow! that top part of cracked glass is such a great idea! It's amazing how you adorned the box. So cool. Thank you. I love the use of the eye chart! Thanks for sharing! Cool idea and thank you for the inspiration! Love that stencil. Love this, so interesting and clever. This amazing piece just blew me away when Tim showed it. It's clever and - well - beautifully creative. I am astounded by the mica "window" and have wracked my brain trying to figure out how you got mica that way. This is such a clever project.....especially all the elements. Very creative. Love this piece Vicki and that addition of the mica took it over the top...so awesome!!! The shattered glass was a genius touch! Oh this is so cool! From the soft stenciling to the 'broken' glass... great layers and textures! Love that you used fabric and even stenciled on it! Thanks for sharing! Wonderful piece! I love the gears at the bottom and the cracked/broken glass is such a cool look! Vicky, this is fabulous! Love the mica sheet and the chippy paint on those numbers. Loved the cracked glass on the top left corner! Your makes captivate me! This reminds me of a museum piece. Thanks for always inspiring me! Totally awesome project on every level ♥️♥️♥️♥️♥️ so inspirational and thanks for your photos of the process steps, so much to admire and appreciate, the Mica piece is simply genius!! Such a creative project!! Must get that eye chart for sure!! Thanks for your inspiration!! So original! love it, bravo! Dang girlie! This project is just amazing! The cracked glass is a fantastic effect! You always inspire us girlie! Congrats on a great project! What a perfect gift for your eye doctor! I love this!! Just amazing - fabulous assembly of objects! So fun to see - each time I look I find another wonderful design. Brillant use of the mica! Im a big fan of your creativity, Vicki- I may not visit often ( time doesn't allow) but always admiring n loving from the side lines so it kinda goes without saying that I totally LOVE this. YOu got this style of creativity well n truly nailed and you always make it your own! Great box, love that it looks simple but everytime I look I see something else that's interesting. Thank you so much for the inspiration and sharing. Love this project, great use of the vignettes box and all that lovely metal. Such an amazing piece of artwork, as always Vicki! 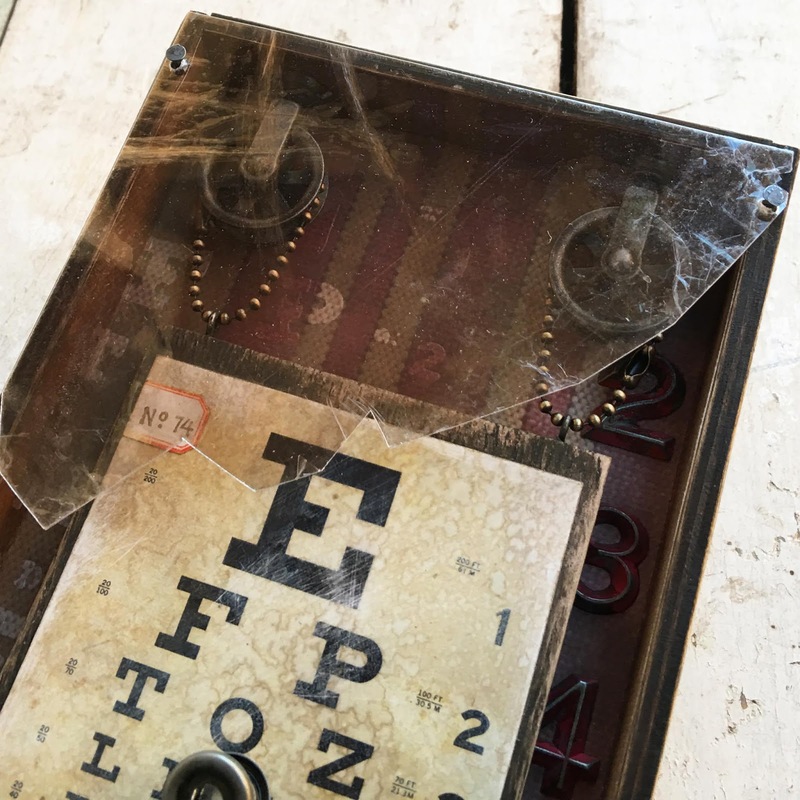 I love how you used the ball chain with the pulley wheels to suspend the eye chart. You always have the best creative ideas, such as that wonderful piece of mica. I think I need to find bigger pieces of that stuff now! This is such a cool and amazing project! Love it! So clever and very creative! This whole project is super creative and I love every bit of it! The way you hung the panel from the bead chain and wheels...the clear texture paste of the eye chart on the background paper and last but not least that awesome new date dial...fantastic! 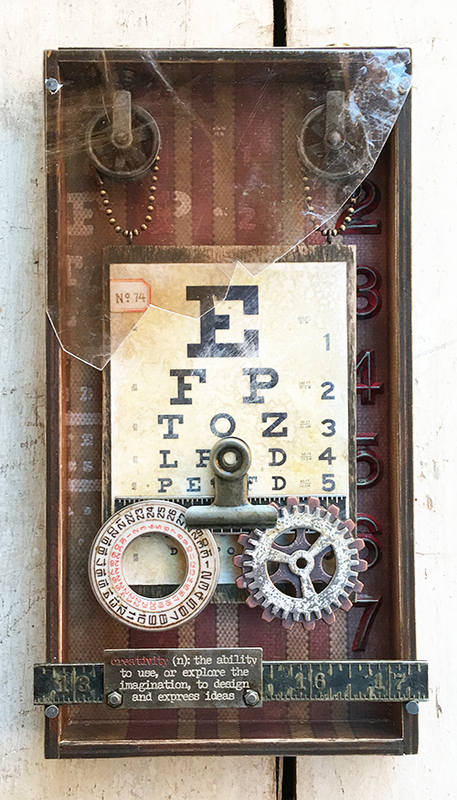 Love the gears, eye chart ect. This is very industrial looking which is great! Quite unique, different, I liken it when somethng done out of the norm, inspiring. This is beautiful! Loved reading your thought process! I can see clearly now, what my next project will be. Fun, fun. This is so clever! I love how it tells a story with the different elements!! So cool! Amazing textures, layers and design. What a wonderfully creative and fabulous piece. Love your vignette tray! Beautiful inspiration, thank you. Amazing project!! I love all the different elements. The pulleys are a favorite! This is just such a fun creation. I really like your project. I used to work for an eye doctor so the eye chart always catches my eye in any piece of art. I have my grandma's old eye glasses that would look great in a piece like this! TFS! This is a "statement" piece, full of unique eyecatching details! Beautifully done. Thank you for sharing your artwork with the rest of us. Vicki, I love every single piece of this! 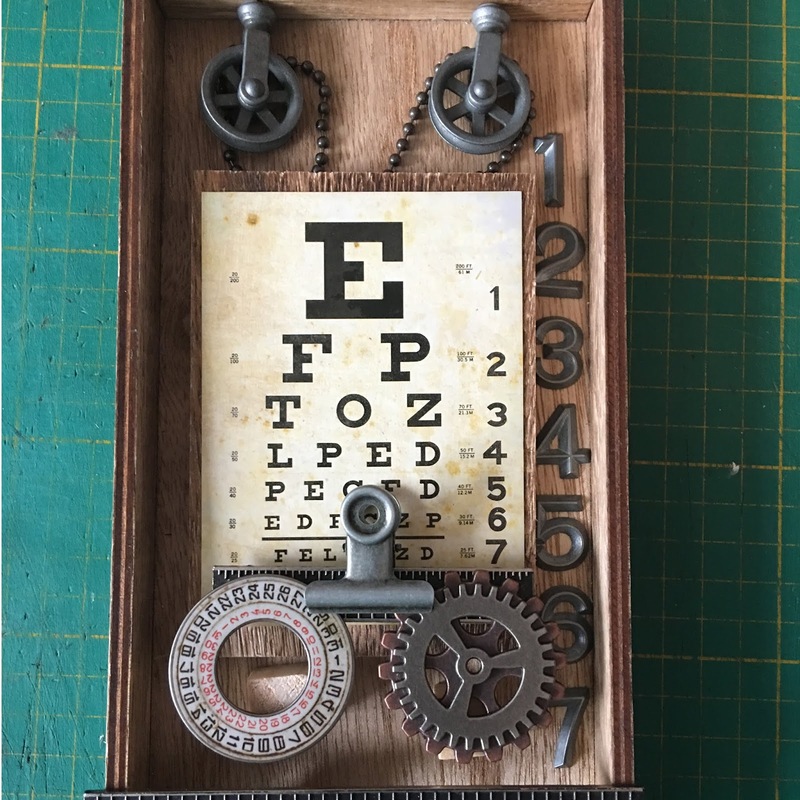 All the details, the eye chart and all the Ideaology pieces! Your style absolutely blow me away! Thanks for sharing! I wish I had your creativity! Amazing work- I love the details! This is so inspiring- thanks for sharing! Love this piece. The addition of the glass (a piece of mica?) is a perfect addition. Wow, this is such a cool piece. Love all details. Love all the textures! My very favorite touch is the use of the wheels! What a fun way to hang the sign. Thanks for sharing! Fabulous creative project! Thanks for sharing your inspiration! Great project with a more masculine feel. Another favourite on this blog hop. Truly a work of art and I can’t stop looking at all the elements. I love everything about this project, but especially the use of glass/mica which I haven’t come across before. Fantastic, thank you for sharing...now I want to go and play in my craft room! I enjoyed reviewing your ingredients list and then seeing how all the elements came together so wonderfully. There isn’t a single detail, in this project, that I don’t absolutely LOVE! I think that. I find something new to love, each time so look at it, too! I have to say, I ordered some mica sheets, after seeing what that touch added to your creation, too! This is BEYOND awesome! I love the pulleys and the shattered glass look. Thanks for sharing! OMG, love this little project! One of my favs! I love the part with the the ruler and the arrangement above it! Thank you for sharing with us. This blog hop is so much fun!! Fabulous! Love the look of broken glass! I really Love your creation and you are indeed a talented person.